Anna Bolton | Greene County News Cedar Cliff Superintendent Chad Mason and Treasurer Joy Kitzmiller listen as Board of Education President Charlene Campbell speaks during the regular Cedar Cliff Local Board of Education meeting Nov. 19, attended by parents, staff, and community members. Attendees spoke about the need for a School Resource Officer during the public hearing. 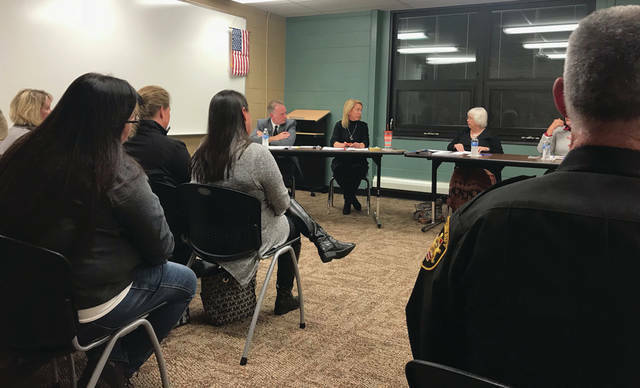 CEDARVILLE — Cedar Cliff parents are speaking out about the need for a School Resource Officer in the village’s school district. And they all seem to preface their points with the same message: bad things can happen anywhere, even in quiet villages. “But Mom, that won’t happen here. This is Cedarville,” Leah Lind-Acton said her son, a Cedar Cliff student, told her one day. “I, too, have fallen into the trap of believing that somehow we are safer here,” Lind-Acton, a victim advocate in Xenia, told the Cedar Cliff Local Board of Education at their regular meeting Nov. 19. As School Resource Officers (SRO) are becoming the norm for many districts across the state, some parents are beginning to think that maybe it’s time for Cedarville to follow suit. Aside from Yellow Springs which has a “school liaison officer,” all other public school districts in Greene County have at least one SRO. School shootings, bullying, drug use, mental health issues — parents mentioned all of these reasons and more as to why the board should consider adding an SRO. It’s about prevention and proactivity, they said, during their allotted-5-minute-or-less speeches. “I do believe an SRO is a critical piece of this puzzle of how to better protect our children. A well-trained, well-chosen SRO can focus on prevention and early-intervention for many of these dangers our children are facing,” Lind-Acton said. SROs, as law enforcement officers, focus on safety and crime prevention in schools. They can make arrests and respond to calls, and are trained in mental health awareness, de-escalation techniques, counseling and crisis management. SROs are usually coordinated between the local police agency and school administration. Cedarville Police Chief Burt Roberts said he had a conversation with administration members before the school year began and learned that they were uninterested in the idea of hiring an SRO. At the most recent meeting, he cited the increasing number of school shootings. Roberts also mentioned a social media threat that he said happened at Cedar Cliff last school year. Deputy Doug Hale, Southwest Ohio SRO Representative, brought stories to the meeting from his 24-year career as an SRO. He described an image of an SRO who “doesn’t sit in an office all day long” — but one who helps out in the cafeteria, mentors and advises kids, builds relationships with students and staff — and is there for protection. Hale said funding for SROs varies at different schools — sometimes the school district pays fully for the SRO, sometimes the police agency and the school split the cost. Limited funding, like drug use prevention grants, he said, are helpful. Other mothers at the meeting pleaded for the board to include parents, teachers and staff in any future conversation regarding consideration of an SRO. As board president Charlene Campbell closed the public hearing, she noted that the board had recently attended several sessions on school safety and had listened to SROs, deputies and superintendents. https://www.xeniagazette.com/wp-content/uploads/sites/32/2018/11/web1_CedarCliff-1.jpgAnna Bolton | Greene County News Cedar Cliff Superintendent Chad Mason and Treasurer Joy Kitzmiller listen as Board of Education President Charlene Campbell speaks during the regular Cedar Cliff Local Board of Education meeting Nov. 19, attended by parents, staff, and community members. Attendees spoke about the need for a School Resource Officer during the public hearing.